My brother Peter had been curious about our family name because there were no other Saltsmans in the Manchester telephone Directory but it was not something ever discussed by my Mother & Peter was reluctant to pursue the matter until after her death. When he hired a genealogist to look into the matter, the result was a considerable shock, for the reasons I have explained in my Origins essay. He wrote to me with the information at the beginning of 1996. When I said to my husband, Ken that I was a German & what did he think of that, he replied that he was a musician & what did I think he thought - Bach, Beethoven, Brahms, Wagner & explained that he had thought it was a name of German origin but, as an admirer of German culture, this was scarcely an issue. (He speaks some German). However, I was more concerned about more recent German history & it is difficult to banish such thoughts. I started to take German classes at the City Lit. In April 1997, we became aware of the Anglo-German Family History Society & joined it. It does not sort out people's families for them but has a large number of resources, which I tried tapping in to. Because of various other concerns, we did not attend any of the society's meetings until after going on a coach trip with them to the Mosel region in May 1998. We enjoyed the holiday & started to attend the bi-monthly meetings in June 1998. We made contact with various members in the Manchester area & the man who eventually set up the Manchester Group, Anthony Steven, was particularly assiduous in seeking out information about the German connexion with local industry. He found Joseph in Slaters Manchester Directory for 1851 when he was 14. However, while other snippets of information about Joseph Saltzmann did appear, none added much to our knowledge of his ancestry. We also tried contacting the German Lutheran Church in Stretford but did so when they had just changed pastors, so he was unable to help. This was at the end of a Scottish trip in August 1999 & we looked at the few locations we had for Joseph in Manchester. They had all been rebuilt. Ken searched on the Internet, which we had only really started using in April 1998, when I had an art show to publicise, so we needed a web site of our own. This soon included the AGHFS site, which Ken maintains. However, the search facilities on the Web were still rather primitive in 1998 &, while we were able to contact a number of Saltzmanns & Salzmanns, none appeared to be related to me. A complication arose with Joseph's marriage certificate: his father was named as 'Meinrad', which Ken did not believe was a name at all & supposed it to be a mishearing of Meinhart or Meinhardt, which are names. Also, Joseph was stated to have been born 'in France' with no further detail. The spelling 'Joseph' is French (Germans spell it 'Josef') but Saltzmann seems German, so we thought that Alsace-Lorraine might be a possible area of origin. We planned to visit the are some day, when we had something more definite to go on. This was not to be for a long time. Meanwhile, we took part in the social activities of the AGFHS, going to the Christmas Markets, based in pretty Boppard in December 1999. Roy, the tour organiser, lost his wife in 2000, so Ken found himself organising a Christmas Markets tour based in Aachen for December 2001. However, by the time that tour happened, we had made a little progress. "Hello Avis, I was working in Salford and found 30 minutes to visit the local studies library. Had a look at the street and trade directories for you. Joseph appears in Slaters 1893 and 1894 directories with a business address of 22 Cooper Street and a residential address of 35 West Ashton Street. He is in Kellys 1895 directory showing only his residence as 35 West Ashton Street, Eccles New Road and after that there are no more entries for him. I checked to 1905. It would seem likely he died 1894/95 as the 1895 directory would have been compiled in 1894 or even 1893." In August, Ken found a Pierre Saltzmann, born in Lafrimbolle, Lorraine, in 1840 who had emigrated to the USA. Lafrimbolle is too small to show up on our Europe Motoring Atlas, so Ken bought a local map & there it was, in what seemed to be a pretty area. We resolved that, tenuous as it was, Lafrimbolle was a place to visit & see what we could find. Ken searched the on-line telephone directories for Saltzmanns & came up with some interesting numbers. There were 75 Saltzmanns in France & only 15 in Germany with the 't'. There were plenty spelt 'Salzmann' but Roland Saltzmann had told us by e-mail in 2000, that the 't' ones were not German. One of the Saltzmanns was Claudine, who lived in Abreschviller, nearby Lafrimbolle. I had started French classes (the German ones ground to a halt when most of the class could not keep up) & wrote to Claudine in my bad French. This was corrected to poor French by a member of the AGFHS & sent but I had no reply. Then, we found Steve Johnson on the web in April 2002. He was descended from Pierre & also put us in contact with Jaris Roth, who was descended twice from Pierre. 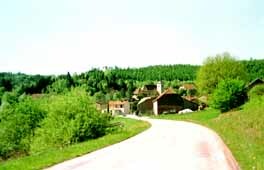 Because of the bleakness of a drive across Northern France, we flew to Zürich on 8th May 2002 & hired a car. We intended to stay in Schirmeck, as being central in the region we wanted to check. But there are no hotels (luck:1), so we drove to Abreschviller. The only hotel with a room was the Cigogne in the centre of the village (luck:2). I mentioned my mission & (luck:3), the barman knew Claudine, gave us her telephone number &, it appeared, rang her to warn of our presence. I rang her in the evening & (luck:4) although she speaks no English, has an English speaking friend, allowing us to make a date for a beer the following evening. Meanwhile, I searched the Abreschviller Mairie (Town Hall) records. No luck, so we drove over to Lafrimbolle to the Mairie there. Several Saltzmanns but nothing obviously relevant. Then, we tried the Sarrebourg archive, as that was the nearest proper town. All the bureaucrats were very helpful at all the places but no luck again. 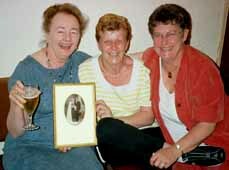 That evening, Claudine & friend Françoise brought her grandfather's wedding photo with her family tree for last century on the back. She told us (luck:5) that she came from Rixheim & that that was the only place with many Saltzmanns. (If I had plotted the telephone directory Saltzmanns on a map, I may have discovered that). We invited them to dinner the next day & learned more about the family. Claudine had thought my letter was a joke, as Lafrimbolle is so small! So, we drove down to Rixheim, staying at a hotel in Mulhouse. At the Rixheim Hotel de Ville (Town Hall), we met Benoit Meyer, Chef de Service & a real genealogy enthusist (luck:6). He found a Joseph (there were not many) who's dates seemed correct but his father was Jean. At this point, Ken (luck:7), who had never been happy about the Mainrad name, had an inspiration. It wasn't his name. It was a mishearing of Gemind(es)rat (Councillor) by the Manchester registrar. Joseph must have been puffing his origins at his wedding. As in Britain, the wife receives the Marriage Certificate, he may well have been unaware of the error & we think Ann Roylance was probably illiterate. Joseph's mother was. There was no stopping Benoit, who dug out all the records, some in ancient books in beautiful copper-plate handwriting & traced my family back for four more generations. Jean was a mason & we may have seen some of his handiwork in the cemetary of Rixheim Church, which was full of Saltzmanns & the other families I am descended from. One last indicator - Alsace is largely Catholic but not this corner, which was once Switzerland & Calvinist. Joseph was a Protestant who married in Manchester Cathedral. The family tree is on this link. We were left with some grounds for speculation, as we visited the excellent Textile Museum in Mulhouse & learned that there had been a free School for Textiles & Practical Geometry in Mulhouse. We wondered if Joseph had studied there. He was also the son of a second marriage, so he may have left Alsace on the death of his father, who was 50 when he was born. © 2002 Avis Saltsman. All rights reserved.